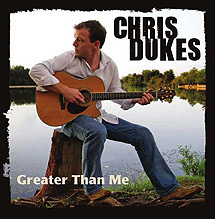 The Chris Dukes Band was voted "Best Local Rock Band" in the 2014 Metroland Readers Poll! Chris has received favorable press from The Daily Gazette (Schenectady, NY), Metroland (Capital Region, NY), The Evening Sun (Chenango, NY), Albany Times Union (Albany, NY), and the Indie Music Review (Wasco Publishing) which wrote, "...Not only has he built a solid fan base with his driving rock with great guitar and vocals, he has sung in several major television commercials that showcase his musical abilities." 500 people came to see Chris and his band perform on New Year's Eve at Jillian's of Albany. The show benefited the Leukemia and Lymphoma Society of New York. WEQX Radio (102.7 FM) in Vermont has featured Chris' singles "Fallen Down" and "Heaven" on their award-winning local music show EQX-Posure for the past few months.